Earlier (2014-15) we published a series of articles under this title. These earlier articles have now been replaced by an updated and , as we hope, enhanced version. The series of articles have, after editing and text additions in the mean time also been published in book form, and is published in India at Prakrit Bharati Academy1 The main topic is whether consciousness existed before and exists outside physical matter in the universe and during states of excarnation, or that it is a product of the physical and chemical complexity of the brain; or how consciousness works on matter in such a way that proper vehicles are formed for the expressions of itself. You will find information of the view of various cultures on what types of consciousness may exist between death and possibly rebirth in a next body. The development in knowledge about the structure and functioning of the brain is extremely interesting. This is mainly due to the explosive increase in possibilities of perception through technology and its ever more refined instruments, and the growing understanding of biochemistry and biophysics. It is also due to the human inquisitive mind and these material and psychological factors strangely combine most successfully in what we call ‘western culture’. That this culture is ‘western’ is partly due to economical reasons, climate, etc, and, last but not least, the discovery and (partial) understanding of electricity, electromagnetism, the divisibility of the atom and the oneness of matter and energy. It is also due to the fact that such minds nowadays seem to be mostly born in the occidental part of the globe – and the fact that as many of those born elsewhere with a like mindset tend to move to the west if they get the opportunity. This has not always been the case though. Three ways to knowledge are available to humankind: science, religion and philosophy. When approaches are taken together these make a ‘whole man’ (i.e. one having completely developed manas – mind). Science means painstaking perception, collection of hard (undeniable, indubitable) ‘facts’, and categorization. Science is the highest pursuit of the human speculative intellect in its quest for knowledge. Science on its own is inductive by nature. Theories are ‘intellectually fancied’ to explain the perceived facts. Science on its own can not reach beyond the human intellect, and therefore never arrive at ultimate Truth, free of all illusions/ theories, because the mind is by nature unable to see the oneness and fountain-source of all truths. To transcend this mind means enlightenment, nirvāṇa. Beyond mind is buddhi, i.e. spiritual intuition, direct knowledge or distinction between real and unreal. The self-conscious functioning of buddhi represents the development of humanity in future cycles – and only ‘shadows’ of that can help us today. Religion involves the faculties of believe and confidence (trust) – phenomena which have become weak in our times. Great men and women, yogi’s, enlightened beings, have gained deep and essential transcendental insights and taught parts of it to humankind. This is not a recent phenomenon – it happened in the far past and it still happens today. Such people had done everything to develop their mind to fullness, and to transcend the natural limitation of mental thinking. The greatest of them penetrated beyond the limits of where the intellect can go and entered the realm of direct truth or intuition, buddhi – sometimes called omniscience (all-knowing), actually having direct ac-cess to the source of all ideas that can be known. Enlightened beings see the source, unity and connectedness of all phenomena, and under-stand that there is a still deeper source – that of oneness – from which all phenomena originate. This source has been called Parabrahm, Tat (‘that’), Śunyatāi (‘emptiness’), Ātmanii (‘Self’), also Jīva (infinite life-consciousness) etc. 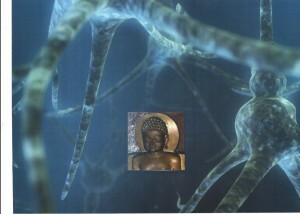 Actually no human word or name can properly express it, because the mind can not reach beyond itself. Those who have accomplished Religion in a high sense often become our spiritual preceptors and teachers – but because the limited capacities of non-enlightened minds they can do little more that give hints that help to stir the intuition of those who truly strive to true knowledge and wisdom. These hints, as far as we can grasp them, are like transcendental axioms from which we can deduce conclusions. Most western people do not accept spirituality as a reliable source of wisdom, and therefore discard its axioms. The hints by themselves are reflections of wisdom-insight, put in symbols, rituals and words for our understanding. When we devote efforts to penetrating into the direct source of such hints, we move into divine direction. Before we dare to devote ourselves to the words spoken or written by others on their authority, we have to ‘give our heart’ (credere (Latin) – belief) in trust. How many (so-called?) religious teachers and yogis can be trusted nowadays? Not many, certainly not those advertising themselves in public. But can we not be sure that real great founders and pioneers like Buddha, Mahāvīra, Pythagoras, Plato, Zarathustra, Lao-tzu, Jesus, Mohammad and many others through times immemorial were guided by but one principle: noblest compassion for humankind? They brought great sacrifices for the sake of humanity or those parts of humanity and cultures which had reached a particular stage and with which they had a specific connection. Such people we can trust – however we can not always trust our own interpretations or the interpretations of those who established themselves somewhere between ‘God’ and man, let alone religious dogma. Science gives us the boon of ability to compare and check the information of our senses and a logical mind on the physical level at least, with spiritual information donated to us by spiritually (not (merely) psychically!) advanced or accomplished men an women. In the context of this article we talk about intellectual truth. But we know that religion is not only given to intellectuals. It is also for those who evolve in the field of refined emotion, refining senses and extra-sensual perception, art, ethics, spiritual (but not always intellectual) intuition, recognition of the divine or the soul’s omnipresence in Nature, etc. A ‘whole man’ encompasses all these. The intellect represents but one path. Philosophy uses the information from both science and religion. It combines the two. Philosophy touches the ratio as well as the nous – the manas as well as the buddhi, and thus develops the buddhi of the manas as well as the manas of the buddhi. Philosophy can build bridges between what we perceive and the source and origin of what we perceive. To reach true understanding of our universe in all its aspects, science, religion and philosophy are indispensible means to aspire to both omniscience and transcendental wisdom. Due to frustration with deformed and dogmatized Christianity (don’t blame Jesus though!) the western mind has become ‘sick’ of religion and greatly turned against it (or in some cases, like many of the so-called ‘creationists’ embraced it emotionally while discarding many facts as well as logic). Great parts of the West, even today, have not yet overcome that frustration with religion, and therefore stick ‘safely’ to strict materialism. In fact its adherents are still occupying the castles of science, and have so far succeeded to keep the attackers outside their walls. These walls are crumbling now. But until the right time comes those inside the castles should defend their lot with zeal and purity in the name of Truth itself. They still have their task to fulfill, and nobody of less purity and truthfulness should be allowed to occupy their seats. Perhaps materialism was a necessary and very useful purgation of the distorted Christianity-based western mind of the past period, and let us be grateful for it. Materialism should however not be taken to mean that ‘spirit’, cosmic intelligence, cosmic buddhi, ultimate knowledge, creative activity, transcendental beauty, or tuition by beings of more than just intellectual capacity, should be declared dead. In the contrary, we have to devote ourselves wholeheartedly to the things given to humankind throughout the ages. The following chapters are about consciousness, mind and brain, and about what science can learn in this field from the transcendental wisdom of the ages.